Since landing on Mars on November 26, NASA's InSight lander has been settling in and taking photos. Now the lander has used its robotic arm to take a selfie. 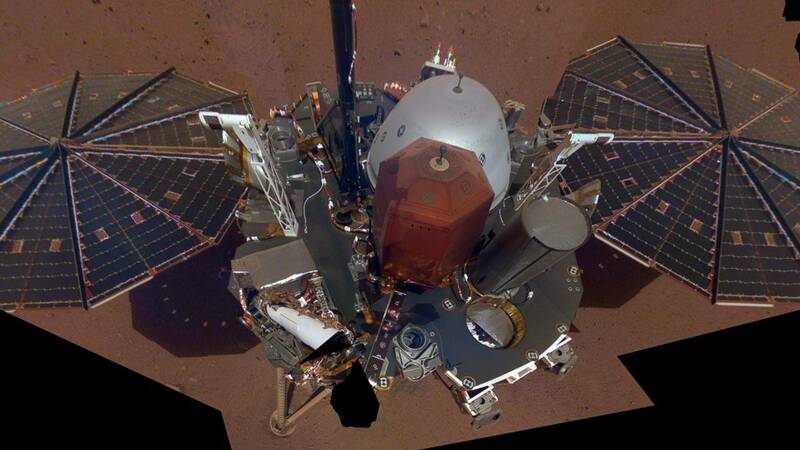 (CNN) - Since landing on Mars on November 26, NASA's InSight lander has been settling in and taking photos. Now the lander has used its robotic arm to take a selfie. This isn't your typical selfie; it's really a mosaic of 11 images from the camera on the lander's robotic arm. If that sounds familiar, it's because the Curiosity rover has used the same process of taking overlapping images to create a selfie and other photos that were stitched together later. In the photo, InSight's unfurled solar panel and instrument-laden deck are on full display. The lander has also been taking photos of its new home, sending back 52 photos of the 14-by-7-foot area of terrain right in front of the spacecraft. This "workspace" will be analyzed by mission scientists so InSight knows where to place the instruments on the Martian surface. The seismometer and heat-flow probe need a level surface without rocks underneath them. And the flat, stable surface the scientists were expecting turned out to be just that. InSight touched down in an almost rock-free hollow, or a meteor impact area that filled with sand. That will definitely make things easier for the heat-flow probe once it is drilled 16 feet below the surface. "The near-absence of rocks, hills and holes means it'll be extremely safe for our instruments," said InSight principal investigator Bruce Banerdt of NASA's Jet Propulsion Laboratory. "This might seem like a pretty plain piece of ground if it weren't on Mars, but we're glad to see that."